Built straight from the box, apart from thinning the gun shields. The plastic is brittle, fine parts like the front axle tie-bar can break cutting them from the sprue. The plastic is crisply moulded, and the hull is one piece, much nicer than the Strelets-R Austin Putilov. It was painted in Xtracrylics Dunkelgelb, which is glossy, so it was given a coat of Micro Flat with some brown wash added, it looks OK but it hasn't dulled the shine much. The aforementioned tie-bar broke again from handling while painting, and was binned. There are eight decal options, none of which are for the pre-revolutionary period, the roundels I used came from the Don Cossack set for the civil war. This is a war-gaming piece, don't expect high quality and you won't be disappointed. There is a lot of cleaning up and seam filling to do. The instructions are two exploded diagrams. Parts are not numbered so identifying the right part on the sprues can be tricky. I had about twenty five parts left over that I could not work out what they were meant to be or where to put them. The kit is pretty sloppy when it comes to fit and very difficult to set up square. The front wheels are very close to the bodywork so for an accurate model I suspect some modification is needed. I sharpened up some of the detail and scratch built replacement gun slot shields from thin card. Other than that it's out-of-the-box. It was painted in a grey/green mix. No markings. It's out-of-the-box apart from the headlamps and rear tarpaulin. The lamps are made from clear sprue, shaped and backed with silver foil before being set into the kit parts, then finished off with Klear. The rear tarpaulin was cut from the plastic bag the transfers came in, crushed to make the folds, then painted with acrylic as the rest of the kit. This is the Matchbox Renault FT.17. The kit boxcontains this and the Char B1 bis of 1930, and both models comewith markings for 1940. The FT 17 is basically OOB. The diamond markings are typical ofthe 'playing card' motifs used during WW1, and were cut from aircraftdecal sheets- hence the diamond rather than spades or clubs. The little diorama shows Pierre taking a short break leaning ona grassy bank in a sunken lane on the way up to the front line. Pierre comes from the HäT WW1 British Infantry, and hashad his cap reshaped to match the French helmet with cloth covering.The plastic used in these figures is the soft flexible type, mouldedwith lots of flash which is very difficult to remove cleanly,so he doesn't bear close inspection. The base is scenic grass stuck on a polystyrene food tray base,the dirt track is railway model ballast and arabian desert sand. A little bit of fun for the Brampton Model Club show next weekend,with "The French Connection" as the display theme. I found one picture of this truck in British markings so the kit is tweaked to match the picture as much as possible. The grills were cut out of the bonnet sides and replaced with some mesh from a fancy tea-bag. There's a lot of detail in the engine, a little of which is visible through the grill. The top was cut off the cab back and the sides cut back square. For the cab canopy I made a base and framing from 0.25mm sheet, then made the fabric cover from a standard tea-bag, soaked in white glue. The wagon cover is the kit part, though I may replace it with a tea-bag version sometime in the future to make a better match with the picture. The searchlight lens was made from a polished piece of clear sprue. Colours are speculative, Humbrol 80 grass green for the bodywork, and H84 cockpit green for the covers. Thanks to Dame Karen, who gave me the kit. 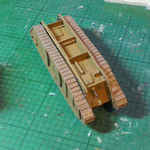 The Mk1 male tank, with wheels, is the 1/76th Airfix kit, built from the box - I liked the camouflage pattern. The tracks were finished in matt rust paint, then drybrushed with a black/silver mix. The anti-grenade netting frame was built from plastic rod and strips of thin plasticard. The netting is net curtain, painted in grey to darken and stiffen it. I based the colour scheme on a picture on the Landship pages, using brown and tan, and speculatively added the red and white stripes. The Mk IV female is the 1/72nd Emhar kit, again OOB, apart from the guide rails for the unditching beam. These were cut from a coke can, folded to make the angle, and fixed to the hull with some 'coke can' angle brackets. The markings are done for a 'Beutepanzer', one that the Germans captured and then put to use. I liked making these WW1 tanks because they don't have hundreds of wheels. A simple build, if you can call it that. The kit has one resin part, the hull, and five of white metal, the rails, exhaust and guns, of which only the exhaust was useable. I made new rails by bending strips of aluminium food tray, and used guns from the spares box. I made new doors, as the hull is moulded with the doors inset. Some of the track was missing along the bottom, but this was the only major moulding fault. This is intended as a war-gaming piece, it looks like a Mk IX as long as you don't look too closely. The instructions reckon it should take 15 minutes to assemble. I spent far longer than that, but even then I didn't attempt to fix all the errors. This build is based on a paper model by Andrei Romanchuk on the Landships II web site, scaled to 1/72. All is scratchbuilt, apart from the machine guns, which are from Airfix Pups. The Skeleton Tank, based on period pictures and pictures at the Aberdeen Proving Ground Museum. Scratch-built from plastic card and tube, except for the tracks, which were cut down from an Emhar Mk IV kit. Built in the evenings while on holiday. This is the 1:72 scale RPM kit, built out-of-the-box. Built straight from the box. The plastic is brittle, parts can break cutting them from the sprue. There's a lot of tiny detail parts. The 'Load not exceed' decal was too large to cut to fit between the uprights of the sides, and didn't respond to micro-set or micro-sol. Not impressed. Not a build I particularly enjoyed, but it will add variety at model shows.